Tara has a passion for travel and especially all things DISNEY! 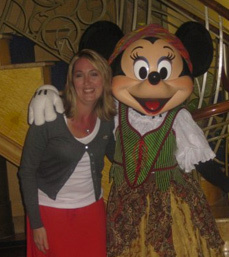 After helping friends and family plan trips to Walt Disney World, in 2007, Tara decided to pursue her dream career as a Vacation Planner and joined MEI-Travel. Tara is a proud graduate of the College of Disney Knowledge, and continues her education through many online travel courses including Royal Caribbean, Universal Vacations & many more! It is not very often that a person can say they truly love their job—but Tara proudly states, “Being a vacation planner is the best job in the world! I look forward to planning each and every vacation as if it were my own!” Tara believes vacations are meant as a time to relax, therefore she will take the stress out of the planning so her clients can relax every step of the way! When Tara is not planning vacations, she enjoys spending time with her husband, four children and granddaughter! She also enjoys cooking, scrapbooking, reading, and of course traveling! Although Disney is her first love, Tara also enjoys planning vacations all around the world. Whether you are looking for a vacation visiting the Wizarding World of Harry Potter at Universal Studios, lying on the beaches of the Caribbean or a cruise to see the wildlife of Alaska, Tara would love to help plan your next vacation!